Union members shout "Ganbaro!" three times at a protest in front of the Okinawa General Bureau in Naha on April 23. They were demanding the Japanese government halt its 24 hour surveillance of Henoko protesters and other excessive measures. 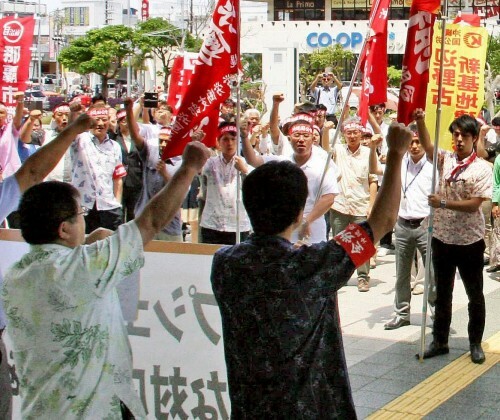 On April 23, 4 labor unions held an emergency session in front of the Okinawa General Bureau of the Japanese Government Cabinet Office in Naha. It included a public service union whose members work for the department which is carrying out the surveillance of protesters at Henoko. The same department is also demanding the removal of protesters’ tents from near the gate of Camp Schwab. The labor unions adopted a resolution to immediately stop the 24-hour surveillance and other excessive measures that could cause conflict between citizens and public service employees. In a questionnaire survey of workers involved in the surveillance, 80 percent thought it was excessive. The Development and Construction Department of the Okinawa General Bureau has ordered its officials to carry out 24-hour surveillance of the protesters. The officials monitor the protest in front of the Camp Schwab gate in three shifts. They regularly visit the protest site between 9 p.m. and 9 a.m. Company workers began monitoring the protesters between 7 p.m. and 6 a.m. from the beginning of April. The emergency session was organized by four public service employees unions, including ones representing workers in the Okinawa General Bureau. This is the first time that these four unions have worked together to appeal to the Japanese government. About 120 union members took part. The resolution stated that the surveillance activities had forced workers into conflict with citizens, which had stressed them out both physically and mentally, and many workers had ended up becoming depressed. It demanded that the Japanese government stop making public service employees engage in any work related to the Henoko relocation.